Food Maestro: Fresh Milk Loaf, super soft. My family got tired of eating bread from the bread maker, so I have to urgently think of new ideas of what to bake before they even mention buying a loaf of Gradenia bread. I really do not want them to eat bread with full of artifical commercial chemicals in in. Well, just in time, I saw some bloggers sharing the Hokkaido Milk Bread recipe and in Youtube as well. But lazy as can be, both recipes were the hand kneaded kind, am I going to hand knead? No way definitely. I do not plan to dump the ingredients into the bread machine because it will come out the same shape and my family members are bound to complain again. So, I have to dump the ingredients into the mixer with a dough hook of course. The mixer can well knead the bread dough till the 'window pane stage', no problem. Well, I am really glad I am born into the convenience of machines era. What am I going to do without my gadgets? I simply love all my gadgets, as long as they can help me reduce my workload, I will continue to use them. I sort of combined the two recipes I found and adapted from there. I reduced the sugar level because I don't really like my bread so sweet. I also skipped quite a few steps being the lazy me. It turned out fluffy and soft. I used my new bread mould that I just bought to give me that 'Gardenia' look. I like the cube like look of the bread mould, it reminds me of my Montessori Pink Tower, which is exactly a 10 cm CUBE. 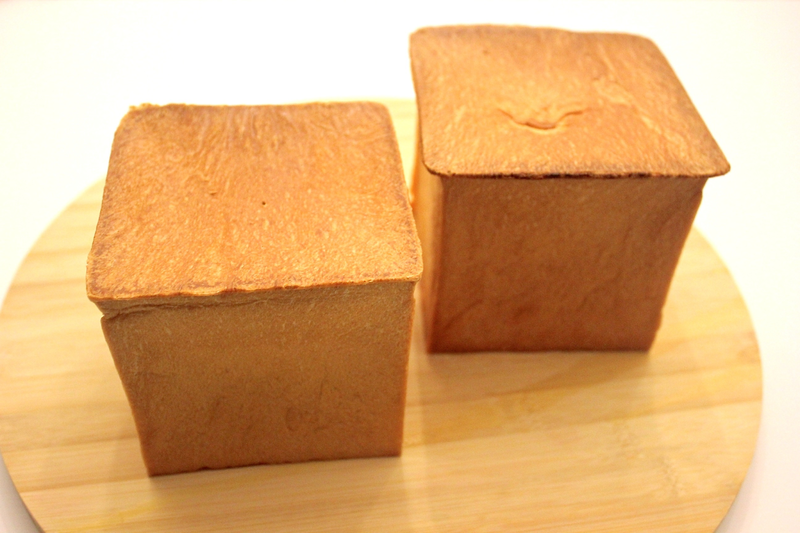 I will not call it Hokkaido Milk Bread because I just used ordinary fresh milk, not Hokkaido Milk to bake this bread. I am not about to go all the way to Meidiya Supermarket to buy just a packet of exorbitant priced milk to bake some bread. This bread is very good and tasty and I can eat it plain. 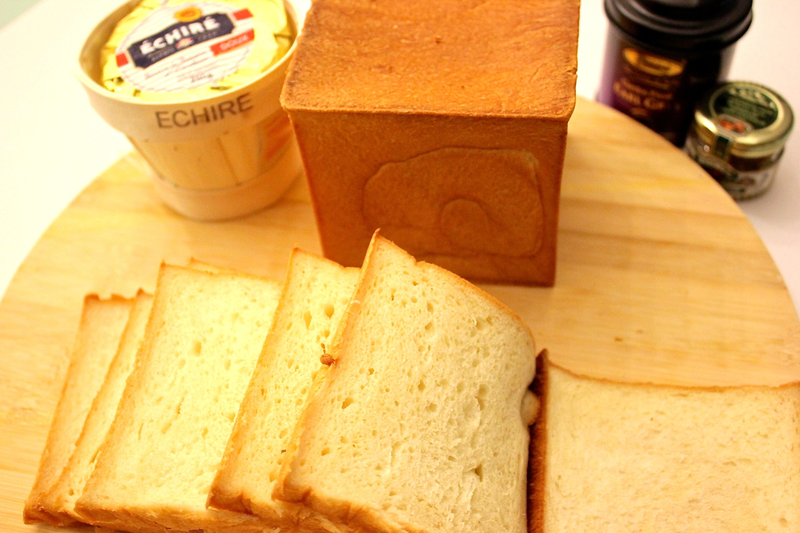 Or better yet, I spread the bread with my favourite Echire butter. Using 2 of 10 cm x 10 cm x 10cm bread mould or pullman tin with cover, 200 C oven, 30 minutes. 1. Put all the ingredients except the butter into the mixer with a dough hook and mix it well at low speed and increase to medium speed when all the dry ingredients have come together. 2. It will appear to be a very wet dough at first. But do not be tempted to add in more bread flour. Be patient, kneading bread dough takes time. 3. It will come together and eventually be a nice smooth dough. Please stand nearby the mixer when you are kneading bread dough to make sure the machine does not move over the edge of the counter. 4. Touch the dough to test that it is no longer sticky, now you can incorporate the butter in. 5. Let the dough hook slap the butter around. Knead till the 'window pane' or 'membrane' stage. It is ready when the dough reaches this stage. It means when you grab a little of the dough between your fingers and stretch it till it is almost trnslucent and it does not tear easily. It does take time to reach this stage. 6. Oil a big clean bowl and store the dough in it, cover with cling wrap and let it proof till double in size for about an hour or so. 7. After it has doubled in size, transfer the dough onto the counter or worktop and punch out all the air. 8. Weigh the dough and divide the dough into two equal portions. 9. Tug the ends of the dough into two round balls. 10. Put it back into the big bowl, cover with the cling wrap to rest for just 15 minutes. 11. After that, take out one portion, roll it out flat with a rolling pin into a rectangle. 12. Now fold the two of 'length sides' in to meet in the middle, resulting into a narrower rectangle. 13. Use the rolling pin, roll it flat again, now becoming a longer rectangular strip. 14. At this stage, roll up the dough with your hands into a rounded roll just like a swiss roll. Please go to http://www.youtube.com/watch?v=PCzyeyJ6ApQ for demo. 15. Put the rolled up dough into the bread mould. Do likewise with the other portion. If you have a 20 cm x10 cm x 10 cm mould, put the rolled up dough side by side. 16. Cover with cling wrap, put it aside to proof till dough is about 80% to 85% full almost reaching the top of the mould. (leaving about 1 cm of the rim). It takes about an hour or so. You can speed things up by putting the pullman tins in the microwave oven with a glass of hot water beside them to heat up the environment. 17. 15 minutes before, heat up the oven to 200C. 18. When it has proven enough, cover the tins or moulds with the lid and bake for approximately 30 to 35 minutes. 19. Take out the bread from the mould immediately when it is baked and cool it on a rack. 20. 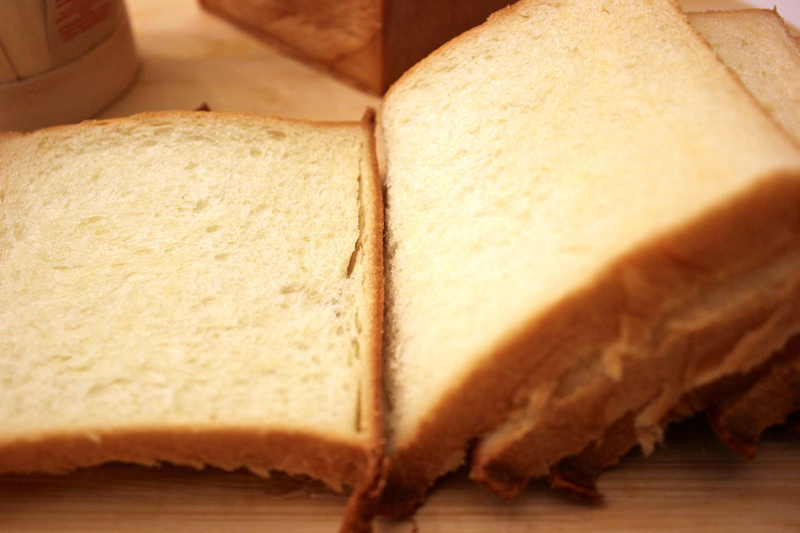 Only cut the bread when it is completely cooled.